This article is a short summary of Yoshi's Woolly World. Yoshi's Woolly World is a 2.5D platforming game in the Yoshi series and released for the Wii U. Developed by Good-Feel, the game has a similar presentation to their previous work, Kirby's Epic Yarn, with the characters and world taking the appearance of yarn and fabric. The game was originally revealed in a 2013 Nintendo Direct under the name Yarn Yoshi before it was re-revealed at E3 2014 with its current title. At retail, a bundle has been released that contains the game and a Green Yarn Yoshi amiibo. Unravel, throw, and stitch to explore in this grand Yarn Yoshi adventure! 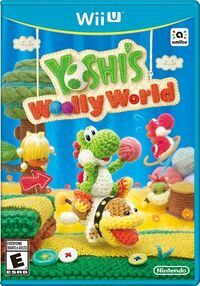 Recover the Wonder Wool to knit over 30 different Yoshis back together! Give Yoshi Wings Float past danger in Mellow Mode. Challenge Co-op Partner with a friend for even more fun! Set off with a friend through a wild, woolly world in this grand Yoshi adventure! A treasure trove of clever and challenging handicraft stages are ready for you to explore. Unravel their secrets and color your world with a spectrum of yarn balls to knit new paths and get every last collectible. Explore each crafty stage to discover new surprises—with no time limit! Activate “Double Yoshi” by scanning your Yarn Yoshi amiibo figure during single player mode to create a second Yoshi at any point during a stage. Set off with a friend* through a wild, woolly world in this grand Yoshi™ adventure! Kamek, that mischievous magic-maker, has turned the Yoshi clan into wool! Now it's up to you to explore a treasure trove of clever handicraft stages and unravel their secrets to save your fellow Yoshis. Yarn, buttons and other materieals combine into fantastical stages for two players to explore as yarn Yoshis. Discover what Yoshi can do by tying enemies in yarn, weaving woolly platforms, or tugging on stray yarn to unravel walls and reveal hidden areas and goodies. Transform into a motorcycle or even become a giant! Want to give Yoshi a new look? Scan compatible Super Smash Bros. or Super Mario series amiibo™ figure and watch as Yoshi patterns himself after them. Join forces with friends to seek out all the collectibles, some of which unlock other new looks for Yoshi. Then show off your discoveries and newly unlocked stamps on Miiverse™! The Yoshi clan is living peacefully on Craft Island until one day, when Kamek shows up and turns all of the yarn Yoshis into bundles of wool. However, he has missed two, who must now go and save the others. Yoshi's Woolly World plays mostly similarly to previous Yoshi platforming games, while also drawing elements from Kirby's Epic Yarn. Yoshi can swallow enemies with his tongue, and can now also swallow select parts of the environment to reveal hidden passages, though when he swallows Yoshi lays a ball of yarn rather than an egg; with these yarn balls Yoshi can attack enemies by throwing them like eggs in previous games, and can use them to fill in parts of the environment or attack. Yohsi's other moves also return and function in a similar capacity, as does the transformation system. Also like with Kirby's Epic Yarn, this game supports two-player local co-op. Rather than have a no-death system like with Epic Yarn, Yoshi's Woolly World makes use of a health meter similar to Yoshi's Story, which depletes each time Yoshi takes a hit and can be replenished by collecting hearts. Players can also swap the difficulty at any point between "Classic Mode", the standard gameplay, and "Mellow Mode", a mode in which Yoshi can freely fly with a pair of wings to give players a less difficult experience. The beads from Kirby's Epic Yarn also appear in this game, and once again act as a currency, allowing Yoshi to buy Power Badges which give the player a specific ability that can be used in that level. In each level there are five Flowers like with previous games, though there are now 20 Stamp Patches hidden in every level, similar to the Red Coins in past games, which give Yoshi a stamp once he collects them all, and 5 Wonder Wools, which unlock a new Yoshi color that the player can use when they're all collected. NA: February 3, 2017 Adds compatibility with the Poochy amiibo. KOR: March 4, 2017 A port of the original game for Nintendo 3DS with new features. ↑ Yoshi’s Woolly World updated in Japan with Poochy amiibo compatibility. Nintendo Everything (January 18, 2017). Retrieved January 18, 2017. ↑ Poochy amiibo support added Yoshi’s Woolly World on Wii U. Nintendo Wire (February 3, 2017). Retrieved February 3, 2017. This page was last edited on 3 February 2017, at 21:16.